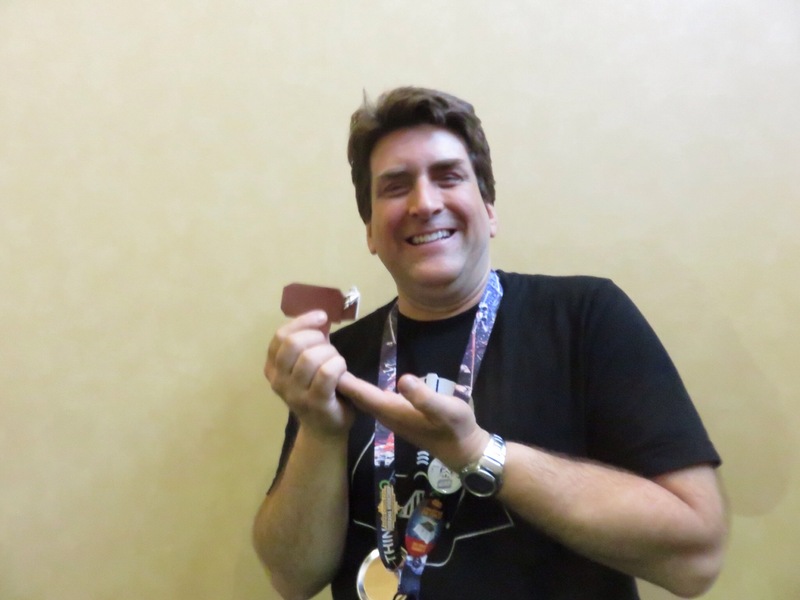 During Star Wars Celebration, it was my pleasure to have a brief conversation with origami artist Chris Alexander. Chris is the author of Star Wars Origami, which teaches both Adults and Children how to fold paper using the origami techniques to create 36 different Star Wars characters and vehicles. When I talked to Chris, he impressed me not only my his knowledge and skill with the art of origami, but I was impressed on how personable he was. He is an everyday fanboy who has an interest in many fandoms, especially Star Wars. Chris is also a supporter of everyday Fangirls, especially his Mom, who attended Star Wars Celebration with him as Salacious Crumb! Chris and his Mom during the Skywalking Through Neverland live podcast from Star Wars Celebration! During this brief conversation, Chris explained it took him over a decade and a half to convince anyone in Star Wars publishing that a book about the art of Star Wars origami would sell. However, the effort he made was worth it. Not only did his book Star Wars Origami sell, it also became a New York Times bestseller. Just after the Star Wars Celebration Anaheim debriefing with Skywalking Through Neverland, Chris showed us his latest Star Wars origami piece, Rey and her speeder from The Force Awakens. So have you tried the art of origami? If so, did you try to create any of these Star Wars origami pieces?